Bake a sheet cake the size that you need. Ice the cake in white icing using a cake spatula and making sure that the surface is smooth. Using blue food color spray (also known as color mist), spray the top of the cake leaving a few white areas. Also spray the sides blue. Now use a little green food color spray and spray a little green on the base where you will be putting your star wars figures on the cake. 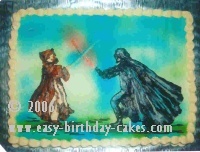 To do the figures, find a picture of the star wars figures that you wish to place on the cake. Place a piece of Plexiglas over the picture. Now place a piece of way paper on the Plexiglas. Using a round tip, outline the entire figure keeping in mind that the colors you put down first will be the color showing the most. Fill in the colors until the figure is complete. Now, put the Plexiglas in the freezer and freeze completely. When it is frozen solid remove quickly and place on the cake. You have to work quickly because they thaw fast. If you have to, refreeze the second figure and then place it on the cake. When both star wars figures are on the cake, use the back of a small spoon to blend in the colors. Now make swords right on the cake using white icing, a round tip and red and blue icing spray. With black icing and round tip, size #5, make lines at the bottom surface around where they are standing. With white icing and star tip, size #18, make a shell border along the top edge and bottom side edge of the cake. Here is another Star Wars Cake.